Since Carina was born, I've been a bit of a delinquent when it comes to getting photos printed or framed and hung on the wall. I guess there's really no excuse other than pure laziness on my part, which is why I jumped at the chance to personalize and customize a photo gift from Bags of Love. Established in 2003, Bags of Love provides a unique and growing range of personalized gifts. Their mission is to combine dedicated customer service with impeccable photo printing and luxury gift products. Bags of Love™ oversees the entire production process, from end-to-end, to ensure each gift is printed and constructed to the finest possible quality. Their online design tools have been developed to be user friendly and compatible with your very own digital photographs, uploaded from your computer or Facebook account. You are able to personalize the design of each product, and preview the result online free of charge. We chose the Laundry/Toy bag because of its versatility. Every now and then we need an extra hamper to truck our 5+ loads of laundry down to the basement, while at other times, we need something to contain the baby toy explosion in our home. The folks at Bags of Love were super helpful and patient as I took forever my time making sure the photo layout was just perfect. I chose 10 of my favorite pictures from the last year. You might recognize some of them! Again, I must be the most hormonal pregnant person ever, because as soon as I opened it I started tearing up. The photos are so clear and perfect; even Mike, who doesn't usually get super excited about things that comes in the mail, couldn't believe how amazing it looks. Upon first seeing it, Carina exclaimed that it is, "awesome!" She circled around pointing out "Mommy! ", "Daddy! ", and "baby!" I don't think she realizes that the baby is actually her quite yet. Apparently Mommy's credit cards go in with the toys?!? 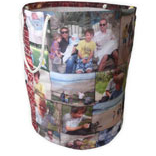 Bags of Love has the widest array of photo canvases and customized photo gifts that I have ever seen. 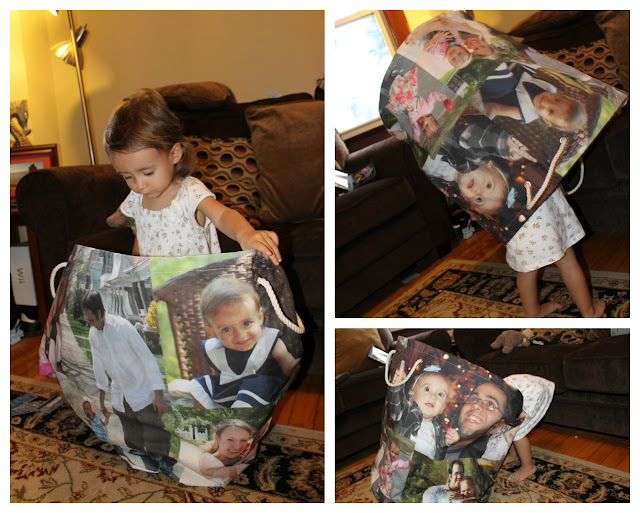 Want to put a picture of your little one on a laptop case, makeup bag, or apron? They've got that. How about on a table cloth? Yep, that too. Bags of Love is generously offering one of my readers their very own Laundry/Toy bag that they can customize, just like ours! The first entry is mandatory - Visit Bags of Love and tell me what your two favorite items are (must include two items for your entry to count)! Once you complete this entry, the widget will give you the option of completing the rest. Complete more steps for more chances to win!